My wife recently bought a new Japanese knife. The first time she used it was to cut chinese preserved vegetable. She put the knife to one side while doing something else and forgot to wash it for about 10 minutes. The result was staining as on the attached photos. Does anyone know how to remove the stains without destroying the blade? I have a carbon steel all purpose knife with an 8 inch blade which I use regularly. My wife hates it because of the patina and was supposed to be buying a stainless knife. Something must have got lost in the translation as I am pretty sure the blade is carbon steel. I will try the toothpaste method fist as it seems the least aggressive. If that does not work I will seek confirmation and advice on our next trip to japan. Carbon steel (and I assume this knife is carbon steel) is supposed to do that. The surface staining changes with every exposure to acidic ingredients, and will eventually stabilize. 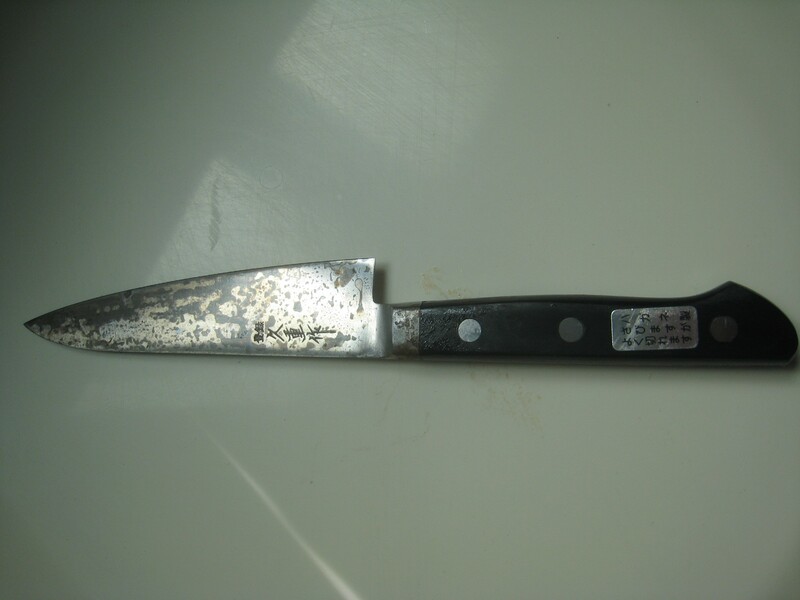 This so called patina will actually keep the blade from rusting properly and/or transferring metallic tastes to food. That said, there are a few spots (the orange ones) here where there is actual rust developing. These need to be dealt with, since in these spots no patina will develop, instead the rust can go deeper into the metal. Try polishing the orange spots with toothpaste, if that does not help use scouring cream, if that does not help use sandpaper or a rust eraser (not: a chemical rust treatment!). Mind that the surface finish in these spots might end up differently from the rest of the blade if sandpaper/rust eraser is used. If you cannot handle this yourself, ask a professional sharpener experienced with japanese knives (the kind that uses big bricklike whetstones over a water basin). 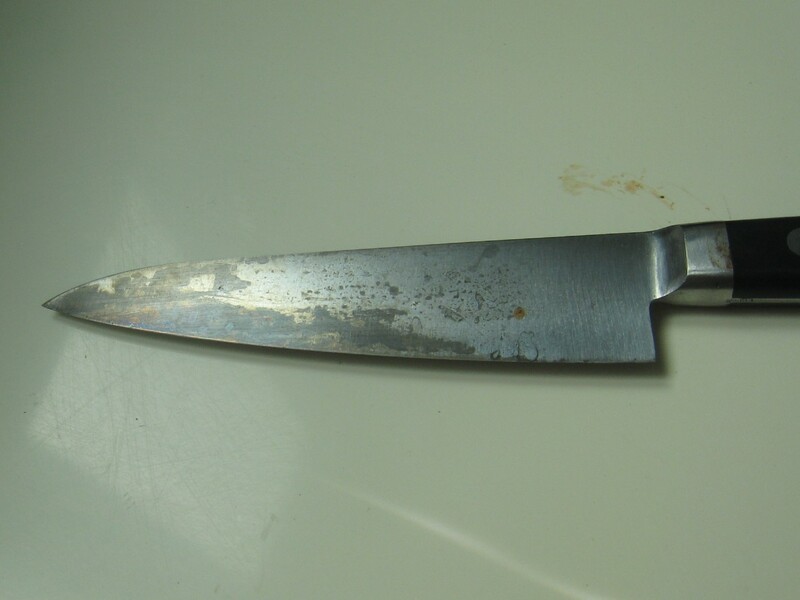 Be aware that this kind of knife WILL patina from acidic ingredients no matter what - however, the chance of there being rust problems could be minimized by having the blade mirror polished (this can change food release behaviour though). I would second the use of a Japanese Rust eraser for this issue. I have had this happen as well, and it is a matter of time. The longer the water was on the blade the more it had time to penetrate into the metal. So 10 minutes won't be bad. But it might take just as much time, or longer to get rid of the rust. The rust erasers come in different types, usually three: rough, medium and fine. I would start with the fine and work my way up. You could either wet the eraser or you could just use it dry. You would have to rub in the direction of the metal's "grain" either vertical or horizontal. 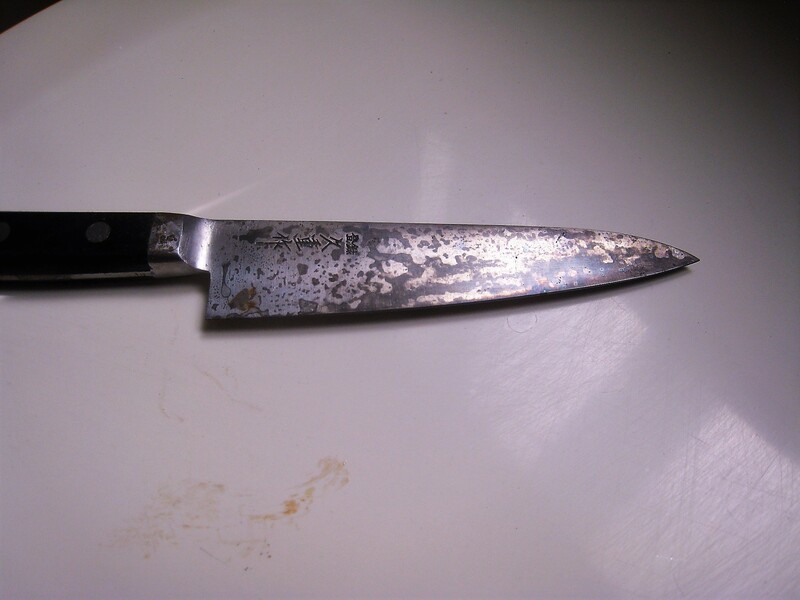 In your picture, the grain of the metal looks to be vertical, from the cutting edge to the spine of the knife. Personally I find this orientation to be a bit more difficult to work with, but is doable. Be very careful, as you will be near the cutting edge of the knife. If you can't get the eraser, another good alternative is to use a daikon or Asian radish and some very fine powdered cleanser. Perhaps Bon Ami or something similar. Comet might be a bit too rough. Cut the daikon so you have a flat surface and then put a small amount of the cleanser on the knife and start to rub the daikon on the blade in the grain direction. You won't need any water as the daikon should be wet enough to moisten the cleanser. Work in small areas, when done make sure to rinse and wipe the blade dry to prevent this from happening again. Or you might have your wife do this as a form of correction, but defiantly have her watch as you labor though this arduous process. Just so it doesn't happen again. Just kidding.